Here's a discussion on A. Fine's blog that's worth following. How do we enlist the sports and entertainment industry so they distribute messages through their own channels that result in a greater, and more consistent flow of volunteers and donations to non profit charities in Chicago and other citeis? Early this morning I attended a kick off meeting of the annual Combined Charities Campaign at the US Postal Facility in Naperville, Il. I had about 2 minutes to make my pitch, so I tried to get the words "tutor mentor" and "search Internet" in my delivery. That was enough for one young woman, who wrote a $25 check on the spot. Thank you! Then I took a look at the Chicago newspapers. The front page of the Chicago Tribune had a photo of a minority youth, with the headline "Gap in Low-Income Kids' Scores Eludes Fix. The Chicago SunTimes also used a picture of African American kids to focus attention on their "Measuring Success in Illinois Schools" story. Inside the message was "City is home to many of state's top schools, but still plagued by poor performers." I read the reports, and you should too. What bothers me is that the writers are not including non-school, volunteer-based tutor/mentor programs, in their articles, or pointing to maps we've been providing showing the lack of such programs in many areas. Rather than a long-winded speech, I created a time line of my thinking. See it below. Because there is so much information being generated on these issues, and because some really good ideas were published in past years, that are still relevant now, I've been looking for ways to map knowledge both from a relational aspect, and a chronological aspect. The chart above starts at the upper left, and moves clockwise to a conclusion that I hope more people who are reading today's news will reach. This suggests that connecting kids in low-income neighborhoods with volunteer tutors/mentors in tutor/mentor programs could have a positive impact. However, as we show on the maps we create, there are too few programs for each age group, they are poorly distributed in different parts of the city, and funding is too little, and too inconsistent to help great programs grow. Furthermore, there is a great amount of difference between the 200-plus tutoring and/or mentoring programs in Chicago. They vary in size, in number of kids served and age group served, in what they do, and the strength of their organizations. I wrote an article in 2008 to illustrate what it takes for a tutor/mentor program to become a "great" program. This all leads to funding. Without consistent funding from many sources, programs like Cabrini Connections cannot attract and retain quality leaders, or build the organizational history and culture needed to attract and retain students and volunteers. If you follow our success steps, you see that getting(and keeping)regular attendance is the first challenge of any non-school program because the kids are volunteers, as are the adults. Until a program builds regular participation, and keeps kids with the program, for 2-3 years, it's not likely there will be significant long term impact on aspirations, which are the motivations that drive student ownership in the learning process. If the thousands of people who read the stories in the Tribune or SunTimes today, or read those about violence in Chicago neighborhoods in past days, will reach these same final conclusion, perhaps more will begin to think of ways they can help provide funding for volunteer-based tutor/mentor programs to operate and grow in low-income neighborhoods. One way is to make a donation through your company or school's workplace fund raising campaign, and to choose Cabrini Connections, the Tutor/Mentor Connection, or another tutor/mentor program in your community, to receive your donation. You can find us in the alphabetical listing at the back of most campaign books. Or you can go directly to this donations place and make a contribution. Try mapping the stories in your own newspapers. If you're doing this and posting your maps on a web site, post your web address on this blog and share it with others. I encourage you to read the Opinion article titled, Their blood is on our hands, posted by Rev. James Meeks, in the Chicago Tribune. Then read these blog articles I've written in the past responding to the messages of Rev./State Senator Meeks. See here, and here. I met with a pastor at Salem Baptist Church last spring and provided an introduction to the T/MC and our map strategy. I've posted other articles on this blog about what faith leaders might do to support the growth of tutor/mentor programs in the city. There's a story in the Bible about "many are called, but few are chosen". The ideas we share can be used by anyone who wants to really build a network of programs that prevent problems before they occur, and help release the potential of kids living in poverty. If you'd like our help to use these ideas, just call 312-492-9614, or introduce yourself via this forum, Facebook, or some other place where we can meet. There are more than 170 tutoring and/or mentoring programs in Chicago. We can't all be in the media every day. Thus, the Tutor/Mentor Connection hopes to help as many programs as possible tell their story with blogs, so that some get into the media and point to a network of bloggers and program web sites where readers can give time, talent or dollars. Last week, Genita Robinson, Executive Director of Lawyers Lend A Hand to Youth was able to get a letter in the Chicago Tribune. Since the newspapers don't like to post web links, readers would need to do a Google search for the Lend A Hand web site. If they do, they will see that this organization raises money for volunteer based tutor/mentor programs, and has a list of programs on their web site which readers could use to build their own involvement. Here's another story about a Chicago Teen killed. This was a 17-year old sitting in a car on Saturday night. 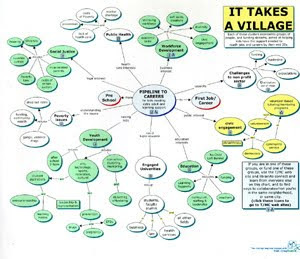 This village graphic is intended to show the different groups of people who need to be talking to each other, sharing the same ideas, and working in the same places, to help prevent this. I've no money for advertising, or I'd have ads in the business publications, and other Chicago media every week, drawing potential volunteers, donors, leaders, etc. to this blog, so that more people would be following the links to the maps, charts and web sites we point to. This would get more people involved in tutor/mentor programs, where they make personal connections with kids living in poverty, and begin a journey of understanding that make many of them more sophisticated in what they do to help kids stay in school and move to jobs and careers. Without a dramatic growth in the number of people involved, and the flow of resources to all high poverty neighborhoods, not much will change. Well, I don't have money for advertising, so one strategy that I try to use is a "blog exchange" strategy. Here's the link to a story I wrote in March 2008 that is posted on the blog of a Stanford University Professor. 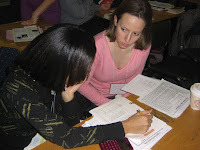 Here's a link to a another blog written about the Tutor/Mentor Connection. Find more like this here and here. Last week was "blog action day" where thousands of bloggers wrote about the environment. I think there ought to be "blog action day" every day, where people all over the country are writing about poverty, violence, poor schools, racism, workforce development, etc. and posting links to this and other sites that provide a path to more information, and to places where they can volunteer time, talent and dollars. If you're writing blogs on this topic, link to me, or email me, or post your link in the comments section. Together, we can create a roar that gets the attention of the thousands of people who need to be involved in this journey. Thanks to Matt Ulrich, Northwestern University alum, and many friends of the TWR Organization, for hosting the Soldier Field Charity Hill Challenge yesterday to raise funds for Cabrini Connections, Tutor/Mentor Connection. I am part of a youth mentoring list serve hosted by Dr. David DuBois of the University of Illinois at Chicago. 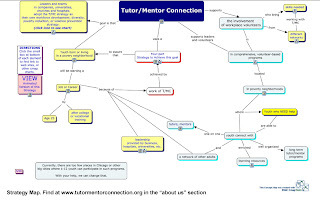 This week I responded to a message posted by Graig Meyer of Blue Ribbon Mentor-Advocate, which is what I often do when someone posts a message and I want to connect and add them to the Tutor/Mentor Connection's network. I'm so glad you took time to reach out. We've actually corresponded on Facebook before. You helped me think through our approach to how we encourage participation in our program. Your advice had a strong impact on a major program overhaul that we just completed. I've been aware of your program since I was in grad school at the School of Social Service Administration from 1996-98. In some ways, Cabrini Connections fostered my interest in this work. I'm sure you know about Youth Guidance, which is where I worked during 97-98 and has had a huge impact on my philosophy about programming for youth. I really like the stuff about maps and community-distribution that you've been doing. I learned about that via Facebook. I just spent some more time exploring your website, and I signed up for T/MC. I'd love to bring my staff to your conference sometime, but that's not likely to happen during this budget year. Every now and then I get a message like this, from someone telling me how much they have used the information we provide to build their own program. It's what we hope is happening. It's what we hope our own donors value, when we ask them for continued funding. If you've been using the Cabrini Connections or Tutor/Mentor Connection as a resource, please let me know, by posting your own story, here, or on Facebook, or on our Ning site. While the media, and elected leaders are calling for new solutions to helping end violence in inner city neighborhoods, and reduce the high rate of high school drop outs, it's the business community who I feel has untapped potential to help. I've posted articles showing that a volunteer-based tutor/mentor program can be part of a company's workforce and diversity development strategies. We've also posted maps that companies can use to plan their involvement around places where they do business, or where they might want to do business. 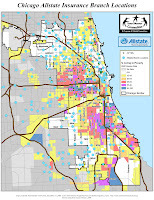 Mike Trakan, who creates maps for the Tutor/Mentor Connection, has created maps showing where some of the Insurance companies in Chicago have locations. The map on the left shows Allstate locations in the city compared to concentrations of high poverty. This week Mike is launching some new maps, showing grocery store chains in the city. This map shows Jewell stores. In all cases we're encouraging a mix of philanthropy, volunteering, and workforce development. We want companies to invest in strategies that connect employee volunteers with kids in elementary school, so that they influence reading, writing, critical thinking, and learning habits. We want these companies to stay connected to these same kids through middle school, high school and even college, so they can influence work aspirations, and provide a range of part time jobs, internships and scholarships, that assure more youth from poverty neighborhoods are working in their companies, or are their customers, when the kids are adults. Most of all, we want them to develop strategies that reach youth in all areas where they do business, or where employees might live, not just in a few chosen places where they might have a high profile involvement. Read more about these goals in leadership articles on the Tutor/Mentor Institute or in this blog. MapTogether.org published an interview this weekend, telling the story of the Tutor/Mentor Connection and our use of maps. The interview is here. Below is an example of maps that you can see in the T/MC's map gallery. 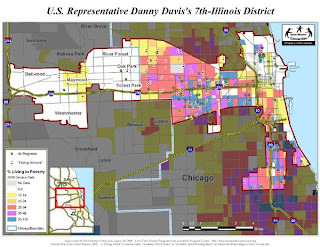 This map shows the 7th Congressional District. Some parts of it include high poverty neighborhoods and other parts are more affluent. The Eisenhower/290 Expressway connects the West end and the Chicago Loop. which means voters who work in the city or suburbs, drive through the poverty neighborhoods every day. What sort of leadership is needed to motivate some of these commuters to become volunteers, donors, leaders, business and church partners, etc. of the tutor/mentor programs operating in the poverty areas on this map? Come to the Tutor/Mentor Leadership and Networking Conference on Nov. 19 and 20 and talk about how you and others can help build and sustain youth program that mentor kids toward jobs and careers in all of the high poverty neighborhoods of the city and suburbs. Join on-line forums and share your ideas every day of the year. Visit Mapping for Justice and read Mike Trakan's most recent article about how maps can be used to mobilize resources for volunteer-based tutor/mentor programs in high poverty neighborhoods. Pass this on to leaders in media, business, faith groups, schools and more people will use these maps. 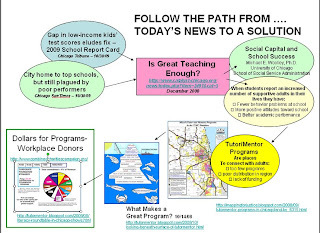 Mike is on the staff of Tutor/Mentor Connection and these maps are a core part of our strategy. If you're an advocate for tutor/mentor programs, we encourage you to use maps and charts to visualize your message. Meet Mike at the Tutor/Mentor Leadership and Networking Conference on November 19 and 20. This is what donors support when they contribute to Cabrini Connections and other organizations in Chicago that operate volunteer-based tutor/mentor programs. In many articles on this blog I've focused on the role of universities, who could tap the talent of students, faculty and alumni, to help build support for volunteer-based tutor/mentor programs operating in different Chicago neighborhoods. With President Obama challenging the Secretary of Education, and the Attorney General to come up with an innovative plan to prevent neighborhood violence, and improve schools, and reduce high school drop out rates, and get more kids ready for 21st century jobs, this type of strategic engagement by universities is critically important. Thus, I'm really happy to introduce you to the Exploring Chicago blog hosted by Janet Hickey, a faculty member at DePaul University. "This quarter, our Explore Chicago: Growing Up in Chicago class will be researching, analyzing and projecting the need for Tutoring/Mentoring services in various areas of the city. We are working closely with Cabrini Connections, a tutoring/mentoring program that serves the children who live in Cabrini Green, a Chicago Housing Authority complex located near the corner of Halsted St. and Chicago Ave. The students will also be writing narratives about their work in the hopes of sharing information about tutoring/mentoring programs in Chicago with other interested people. Watch for the students’ weekly posts and follow the progress of their research." 1. Research: You will read articles about poverty and its impact on learning. Next, you will begin to focus on your assigned area, gathering demographic information and identifying resources, especially tutoring-mentoring programs, in that area. You will visit those program’s websites in order to get to know them. Perhaps you may visit those programs in person. Then you will compare your team’s statistics with those gathered by other teams. 2. Writing: You will chronicle your research by writing weekly articles about the T/M programs: program descriptions, examples of successful collaborations, how people can help, etc. 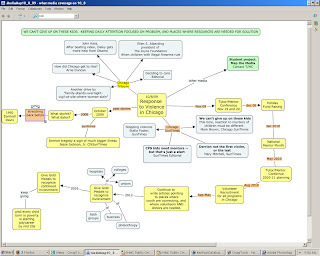 The teams may develop their own Wikis and use NING for their narratives. 3. Mapping: You will learn the rhetorical effect of maps by creating maps that identify where T/M programs are available in your area. You will also create a matrix to help differentiate programs. 4. Projecting: Based on your analysis of your research, you will discuss how to influence public policy regarding the effects of poverty on education. 5. Leadership and Service: You will be asked to communicate what you are learning through networks and channels that are available to you, resulting in more people from the DePaul community, and your own network, learning from the information you are collecting and sharing. 6. Some members of the team will present the group's findings at the November 19 and 20 Tutor/Mentor Leadership and Networking Conference. Read the blogs each week, and you can learn from these first year students more about Chicago than you might have known before. You can also learn about poverty in different parts of the city, and about the different tutor/mentor programs operating in these neighborhoods. Imagine if this were a project at every university in Chicago, and every other major city in the country? Imagine if a team from the business school were using this, and their own talent, to raise money for these programs, such as we suggest in this Business School Connection wiki. These types of innovations can "re-purpose" the talent and time of students to become leaders and intermediaries, who connect the larger university community, its alumni, and its fans, to become volunteers, donors, partners, etc. at tutor/mentor programs throughout every city in America. Thank you Janet for launching this project. On Facebook I saw this note posted by Create the Good. "Did you notice some of your favorite football players wearing pink gloves or pink shoes in yesterday's game? Don't panic - it's not a change in team color, but the NFL's way to show its support for the fight against breast cancer." One of the comments was "This is a great initiative. I hope that some day Domestic Violence Awareness Month (also the month of October) gets the same recognition." I could say the same thing about getting attention for tutor/mentor programs during October, or January, or June. So could Aids Awareness, Black History, and every other cause. 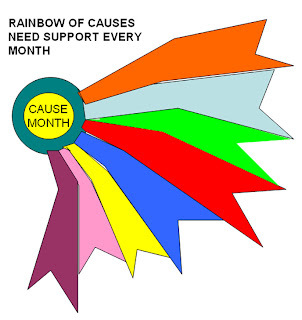 Maybe we need a "rainbow ribbon" that we can use to give donors and volunteers a menu of causes that they can support every month of the year, rather than on one weekend, one day, or one month of the year. If you're going to support tutor/mentor programs, visit this link or this link, and you can support Cabrini Connections, Tutor/Mentor Connection. Visit the Chicago Tutor/Mentor Program Locator and you can learn about more than 160 different organizations in Chicago who do various forms of tutoring and/or mentoring. They all need your support every month of the year, just like Cabrini Connections does. Come to the Tutor/Mentor Leadership and Networking Conference on November 19 and 20, at Northwestern University in Evanston, and meet the leaders of some of these tutor/mentor programs. Here's an article I wrote three years ago about earning awards and recognition like a Nobel Prize. Like any other achievement, hard work, perserverance, creativity and innovation, are required. I have led a volunteer-based tutor/mentor program for 34 consecutive years, which I think is probably longer than most other people in this country. Thus, I've spent more time thinking about the problems involved in changing the thinking and aspirations of kids living in neighborhoods of high poverty, where the community around them models different aspirations. I've also spent lots of time thinking about how to get adults involved in tutor/mentor programs, and how to convert some to leaders, who will spend much more time than one or two hours a week, working and thinking with me, on ways to make our programs effective. I've also spent loads of time trying to figure ways to keep such programs funded, well led, and sustainable over many years, because it takes six years for a 7th grader to graduate from high school, and another 4 to 6 years for them to be in the early stages of a job and career. Finally, I've been accused of being a habitual visual and spatial thinker, because of the way I use maps and focus on helping all poverty neighborhoods of Chicago have great, and constantly improving, volunteer-based tutor/mentor programs. You can follow my thinking if you want to spent the time, by visiting the links and tags on this blog, or by browsing the sections of the Tutor/Mentor Institute. In fact, so can President Obama, Mayor Daley, or any other leader, including the student council at a local high school. Furthermore, you can use the same graphics tools to create your own vision, and blueprint, and use your own blog to invite people to look at your ideas and use them in their own efforts. Maybe YOU will earn a Nobel Prize because of how you apply this thinking, or of how you lead others into this information. Time will tell. Let's see if you're still involved five, ten, fifteen, or even 35 years from now. I keep looking for ways to connect the many different people and organizations who are concerned about the future of the workforce, the social and economic and racial inequities in our country, the violence in our cities, etc. Thus, when I see someone with a unique tool for connecting people, I'm pleased to point to it. 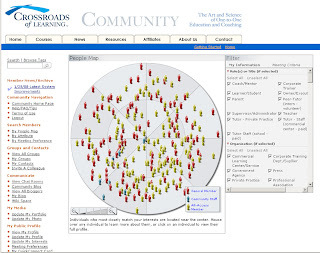 This is a screen shot of a page within the member section of the Crossroads of Learning Collaboration portal. When you register to be a member (FREE) you fill out a profile, and this determines your relationship to other people in the portal. It's a neat tool and I wish I had the money to duplicate it on the Tutor/Mentor Connection site. Do any of you know of open source software that is doing something like this? Today's Chicago SunTimes Editorial was, CPS kids need mentors -- but that's just a start. There must have been a meeting at the SunTimes and the Tribune, where many columnist were encouraged to write articles that reminded readers that this public outrage is not new and that if we don't keep attention focused on this issue, not much will change in Chicago, or in other cities. Of course, I've been trying to focus attention on this issue every day since we formed Cabrini Connections, and the Tutor/Mentor Connection in 1992. I have posted 555 articles on this blog since I launched it in 2005. From 1994 to 2001 we were sending a printed newsletter 3 times a year to up to 12,000 people (we don't have money to do that any more.) Each time I point to the Chicago Program Locator and other links, so that readers can learn more about volunteer-based tutoring and/or mentoring programs, where they are most needed, why they are needed, and choose places where they become part of the solution, as a volunteer, donor, business partner, etc. 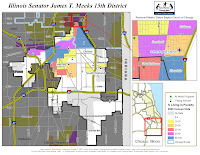 Below is a media map, showing stories in the October 8, 2009 Chicago Tribune and Chicago SunTimes. None of these stories pointed to the Tutor/Mentor Directory, so readers who want to respond, will need to know where to look. If you Google "tutor mentor" you'll find our web site, and that can lead you to other tutor/mentor programs throughout the region, and in other cities around the country. While the focus was on Roseland, a drive by shooting in another neighborhood, took another life last night. Mary Schmich, Tribune, How Do We Stop Wave of Youth Violence? wrote, "Chicago won't be defined by this incident but rather by our response to it. I came here to join with you and with communities across America to call for a national conversation on values......It's a conversation that should happen in every city in America where violence, intolerance and discrimination exist." Ellen S. Alberding is president of The Joyce Foundation. The media map I created does more than point to the many stories written today. It shows that had media been writing these stories since 1992 when Dantrell Davis was killed, and pointing to tutor/mentor programs, and encouraging people beyond poverty to give time, talent, and dollars, we might have more tutor/mentor programs, and fewer incidents of violence. We also might have more kids in college and careers, who were just starting first grade in 1993. 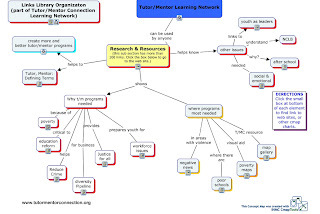 The Tutor/Mentor Connection is just a small non profit. We have almost no money or cash flow, thus we're limited in what we can do. Our strategy is one that calls on many people to take on this responsibility, not just the media, or the T/MC. This means businesses could be pointing to tutor/mentor programs in advertising. Faith leaders could be doing sermons, tying "scripture to service" and pointing to places where people from the suburbs can connect with youth and tutor/mentor programs in the city. It means hospitals and public health leaders could be adopting education and tutoring/mentoring as part of public health strategies. Inner city hospitals could be hubs of tutor/mentor neighborhood strategies. Visit the Tutor/Mentor Institute to see more ideas of how others can take leadership roles. One role that students in a high school or college service learning or media class could take is to map media stories, just as I've done. 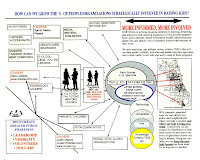 This could be done by students in every major city, creating a system of accountability, and information, that shows who is writing about this story every day, and who us using their writing to point volunteers, donor and students to tutor/mentor programs in the neighborhoods where there is high poverty, poorly performing schools, not enough jobs, public health issues, and other problems that can't be resolved just by "parents taking more responsibility" or "schools having more money for better teachers". If you map these stories, you can post them on blogs, and link to T/MC and others, so that your maps become part of the solution to this problem. Contact us at the Tutor/Mentor Connection if you'd like to take on this role. Nudge the Net -- how do we mobilize personal network to solve problems of inner city violence? If you read the Chicago SunTimes, or the Chicago Tribune today, you'll see multiple stories with themes of "Just don't forget" referring back to times in the past when national and local media outrage was focusing on inner city violence. Now we're entering a new period of learning, according to Arne Duncan, and charged with creating a new national strategy. I'll post links to today's stories in another blog. However, in this article I want to encourage people to think how we might keep attention on this problem 365 days a year for dozens of years. How do we get people who don't live in poverty to think about the problem, and the solutions, so they take active roles, as volunteers, leaders, donors, business partners, voters, to support the growth of programs in multiple locations that help youth move more safely through school and into jobs and adult careers. In the articles on this blog my goal is to help comprehensive, volunteer-based tutor/mentor programs grow, and thrive, in high poverty neighborhoods. Such programs can expand the network of people and learning available to inner city youth, helping kids through school, and in their adult lives. There are two groups of people who I'm trying to influence. 2) the people who don't live in poverty, but who benefit from helping inner city kids move safely through school and into 21st century jobs and careers. In other words, everyone else. Learning to understand your network, the people you know, and the people they know, is essential to effectively building and sustaining a volunteer based tutor/mentor program, or any other kind of organization. Thus, I'm pleased that two of our speakers at the November 19 and 20, 2009 Tutor/Mentor Leadership Conference will be Valdas Krebs and Jean Russel. Here's the description of the workshop they will lead. Building a useful thrivable network is more than "networking" or it's on-line equivalent: "facebooking." We build a thrivable network not just for ourselves but for those around us. When we each improve our individual networks, we all improve our community network -- as long as we are connected and have open flows amongst us. The old strategy in human affairs was: be between -- be the gatekeeper around what you know and what you have. Only allow select individuals or groups through the gate. Much of the world still works this way, especially hierarchies and bureaucracies -- you must pay to play. With the internet, and the transparency it allows, a new strategy is coming into play: be among -- be the connector of those around you. By developing the skill and reputation for connecting others, many will be drawn to you. Your network will grow for others will want to be connected to you -- to key individuals and groups you have access to. Valdis Krebs and Jean Russell will walk you through this new strategy of building a thrivable network. You will learn the process, and experience the practice through workshop exercises. Valdis and Jean will explain the three, interconnected aspects of building a productive and thrivable network. 1) Know the Net -- how do you understand your network and what it is today? 2) Knit the Net -- how do you improve your network to what it could be? 3) Nudge the Net -- how do you mobilize your network to accomplish your goals? You will leave the workshop with actionable knowledge and simple rules you can use every day to improve your network and that of those around you. You can find a list of speakers, an agenda, and a registration and sponsor form at http://www.tutormentorconference.org . There are many people sharing great ideas and experience. If we want to solve the problems of poor schools, inner city violence and concentrated, segregated poverty we must find ways to connect more people who have ideas and resources with each other, and with those people who are already operating programs in inner city areas. Come to this conference and learn more ways to use your network for good. National media are converging on Chicago this week, not because of the Bears, or the Olympics, but because our kids keep killing each other. Here are articles in the Tribune and SunTimes, showing how national leaders are coming to Chicago to discuss strategy and solutions. I'm not at these meetings. I was not invited. I'm only occasionally interviewed for media stories. Sometimes these don't even get on air (we had a CBS New York producer here last Thursday but I don't think the story made the news). Thus, I post my ideas on this blog and hope you'll all pass them on to people who want to solve these problems. It's not that I have all the answers. I don't. 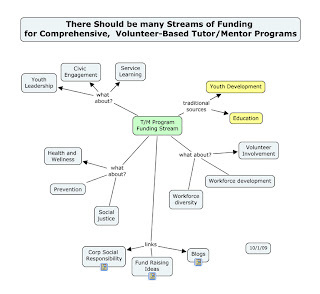 What I'm doing is pointing to places where everyone can learn more about the problem, and about how volunteer-based tutor/mentor programs should be part of the solution. I'm also leading a volunteer-based tutor/mentor program where we try to put these ideas to work every day. There are four sections of information. The map below shows the section with links to research and articles that would help more people understand the problem, and potential solutions, if they were to spend on-going time reading and reflecting on these. 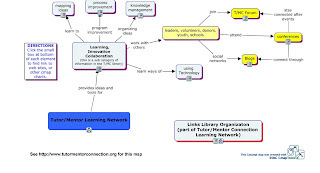 This is a map showing links that volunteers (or donors) can use to find contact information, and web sites, of various tutoring/mentoring programs in Chicago. You can even use this to find places to volunteer all over the country. You can view an animated version of these charts here. 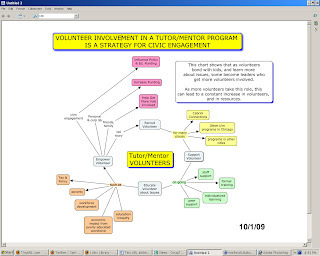 Here's the final chart, it shows how one person can reach out to the people they know to invite them to look at this information, then to do something, such as make a donation, or volunteer time and talent, to help one or more tutor/mentor programs grow in Chicago or other cities with similar problems. We're doing some fund raising this weekend. Visit these links and read about Martini Madness (Oct 9) or Nicole and Nick's Run in the Chicago Marathon (Oct. 11) or http://www.giveforward.org/mappingforjustice/. If you like the Program Locator, please donate to support our map making. If you're a Northwestern or Illinois alum, maybe you can support us in this contest to see which school can raise more to support Cabrini Connections, Tutor/Mentor Connection. There's many ways to be part of the solution. Pass it on. Today's Sunday, Oct. 4, 2009 Chicago Tribune has stories and columns that should be connected to each other. Unfortunately, they are not. I'll try. First was the funeral of Derrion Albert. One of the ministers, the Rev. E.G. Ledbetter Jr., pastor of Greater Mount Hebron Missionary Baptist Church, was realistic when he said, there "is no simple fix for what is wrong in our nation" and "the healing is not going to take place in one fell swoop." The second story, told how a former foster child has received more than a million dollars in college scholarships and now is enrolled at Morehouse College. What did this youth have that the teens who killed Derrion Albert did not have? One part of this story was about "Desmond Kemp, who became a mentor to Quarles -- a brother, really -- when they met at a tutoring program". Of course, the most dominant stories in today's Tribune, were of the Olympics. Over and over there were articles about "making a better Chicago" without the push from the Olympic games. So how are they connected. First, young people can overcome great challenges, but it takes a few extra people in their lives, like Derrion Albert, to become a mentor, or "a brother, really" to these kids. Such mentors won't be readily available if tutor/mentor programs are not in the areas where kids need this extra help. Second, it will take a huge effort, by faith leaders, business people and others to make comprehensive, volunteer-based tutor/mentor programs available in hundreds of locations throughout Chicago, and to keep them in those neighborhoods for many years. Isn't this the type of Olympic size vision that might unite the many diverse leaders in Chicago and it's suburbs? I've written about this many times, but until others, such as the editorial writers in our media, and other bloggers, and our faith leaders, take up this same call to involvement and leadership, it's not likely that we'll get the complex and long term "fix" that Rev. E.G. Ledbetter Jr spoke of. 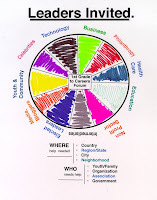 In a recent post titled "Dare to think of big goals, solving big problems", I posted our strategy map, challenging us to find ways to assure that all youth born in poverty in 2010 were starting jobs and careers by age 25. To do that, I feel we need to reverse the funding stream, which is what the diagram below seeks to communicate. I feel we do this by recruiting volunteers from the business community, and beyond poverty, and empower them to be network-builders as they bond with kids and become more personally connected with the challenges inner city kids face that other kids don't. 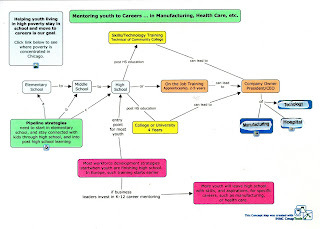 I posted this on my blog in the Tutor/Mentor Connection_Ning site, and encouraged others to draw their own diagrams, showing their own strategies and blueprints for achieving this vision. Words can inspire us to do great deeds. However, blueprints and road maps are needed to help us go in the right direction and achieve those dreams. In the adversarial political climate that we are in these days, I challenge those who use words to disparage the ideas of others, to draw pictures and create visual blueprints showing their own path to a better America. We've had interns help us improve upon some of the rough drawings that I've created. I invite others to contribute their own talent to help us communicate these ideas with more creativity, clarity and purpose. In his blog on the Harvard Business Publishing site, Dan Pallata, says "Nonprofit organizations have to join forces and begin committing themselves to impossible goals that address the massive social problems we confront, and they must define those goals in time and space — a cure for MS in 10 years; the end of homelessness in Boston in 10 years, and so on." He quotes Mark Kramer's recent article in the Stanford Social Innovation Review, who wrote that, "because of fragmentation, redundancy, and the plethora of small organizations "there is little reason to assume that [nonprofits] have the ability to solve society's large-scale problems." How's this for a starting point, "All kids born in poverty in 2010 will be starting jobs and 21st Century careers by 2035" . What do leaders need to do to make this happen? (see map here). Who can help us frame this message to a "scale" that it will attract partners and investors to take ownership and make it a reality?